This study examines the dynamic interplay of interaction goals, emotion, and conflict styles. Using a three (counterpart conflict styles: competing, integrating, obliging) by two (counterpart emotion: anger, compassion) factorial design, this study seeks to understand the dynamic nature of the conflict process. It also explored a model integrating both intrapersonal and interpersonal effects on conflict styles. Proactive-reactive comparisons reveal both overall changes in interaction goals, emotion, and conflict styles over the course of conflict and specific changes attributable to counterpart emotion and conflict styles. Results also indicate that interpersonal effects of counterpart emotion and conflict styles on one’s own reactive conflict styles are largely mediated through intrapersonal processes of reactive emotion and interaction goals. Zhang, Qin, Andreychik, Michael, Sapp, David, & Arendt, Colleen (2014). 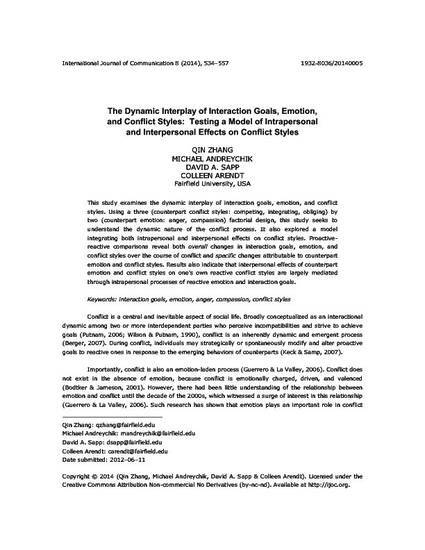 The dynamic interplay of interaction goals, emotion, and conflict styles: Testing a model of intrapersonal and interpersonal effects on conflict styles. International Journal of Communication, 8(24), 534-557.